As the last line of defence, Jonathan Quick is just what the Los Angeles Kings need in a goaltender: a big-time talent that rarely gets rattled. It was the perfect example of why the 25-year-old Quick has quickly risen to the ranks of the National Hockey League's elite backstoppers. Holding a late 3-2 lead against state rival San Jose, the Kings were under relentless pressure from the Sharks in the waning moments. With just five seconds left on the clock, Patrick Marleau found the back of the net to send the game into overtime. The momentum had now swung in favour of the Sharks, but Quick, the 72nd overall selection of the Kings in the 2005 NHL Entry Draft, wasn't about to throw in the towel. But by no means a disaster for the man between the pipes. After a scoreless overtime, Quick came up big in the shootout round, making several big saves in helping the Kings earn a hard-fought victory over the Sharks. The drama wasn't lost on Quick. “You go from a low point to a big high in a very short period of time,” said the goaltender, who finished the 2008-09 season with a 21-18-2 record, a 2.48 goals against average and .914 save percentage. 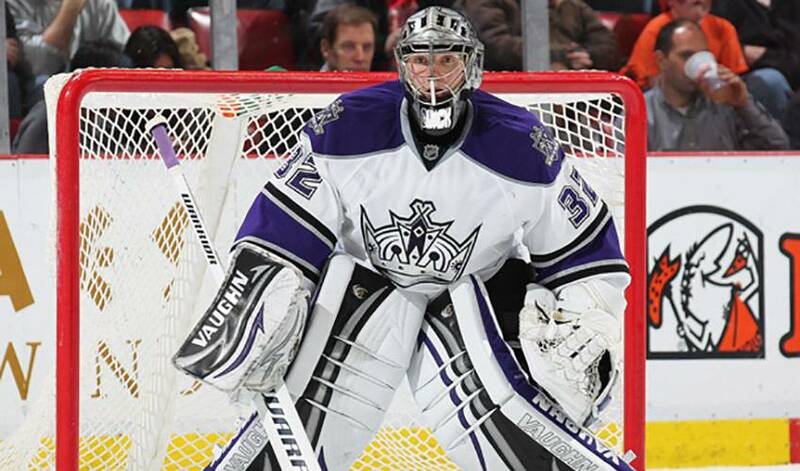 Touted as a team on the rise, the Kings got out of the starting get quickly, rising to the upper echelon of the West. And while they've been playing some of their best hockey of the campaign in recent weeks, there were a few extended losing streaks that threatened to put their season in peril. Injuries have also decimated the Kings, including long-term ones for offensive studs Justin Williams and, just recently, Anze Kopitar. In spite of those tough losses and past losing streaks, Quick likes what he sees when it comes to his teammates' resiliency. Quick sees similar traits between Los Angeles and the Washington Capitals, a team that has endured a rollercoaster season, but has been one of the strongest, most consistent clubs in the league down the stretch. “You could compare us in some ways to the Capitals,” he offered. And Quick is delivering big-time in the big games, perhaps a sign that the Kings could be a major player come the playoffs. Though he's played less than 200 games at the NHL level, the 6'1”, 200-pounder, who won a silver medal with the United States Men's Hockey Team at the 2010 Winter Olympics in Vancouver, British Columbia, Quick is on the fast track to success at hockey's top level. Keeping his life, both on and off the ice, simple, undoubtedly has been a big factor in his winning ways. Which is why a Quick fix, at least if you're a member of the Los Angeles Kings, is never a bad thing.